Just WOW! One of the most spectacular locations we have filmed! We still can’t quite believe how lucky we are to have couples who love our films enough to invite us to join them at such amazing places! 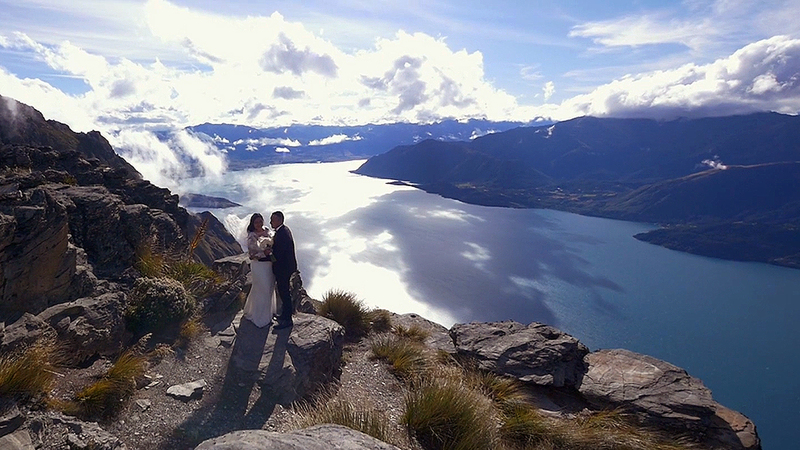 Thank you Eddie + Tracey, for falling in love with each other and with Queenstown, and deciding to make this your destination to become Mr + Mrs! So wonderful too, to be able to lean on the local knowledge of Anna from Alpine Image Co, one of a handful of original Queenstown photographers – definitely one to lock in for your Queenstown wedding from the myriad of other photographers in the area. The weather was iffy on the day, and there was going to be a chance that the couple wouldn’t be able to heli up to The Remarkables for their shoot, but Anna was on and off the phone with her friends at Heliworks, and the moment there was a clear window for flying, she had the excited and grateful couple ready to go in a heartbeat! So easy to work with too.